A few months after quitting Wellington Phoenix, Ernie Merrick was ensconced in his native Scotland and in sore need of some entertainment. Back in the southern hemisphere, Newcastle had just sacked coach Mark Jones because his A-League wooden spooners were miles away from providing anything even resembling entertainment. Jones was the latest in a line of rookies shown the door after one season each, and chief executive Lawrie McKinna was determined to draft in a more experienced replacement. "After Mark moved on I sent Ernie a text first thing one morning and said, 'Are you bored?'" McKinna recalls. "We had 80-odd applicants -- a lot of good ones -- but I actually called Ernie to see if he was interested and I'm glad he was." Initially the appointment elicited varying reactions. Some applauded the engagement of Melbourne Victory's dual championship-winning mentor as the ideal figure to haul the Jets out of their seven-year quagmire. Others thought the 65-year-old was past it. Why not give Steve Kean a go? What about Robbie Fowler or Harry Kewell? Then there's the one McKinna detests -- assertions the "Scottish mafia" had infiltrated the Hunter. While it's true the pair grew up less than 10 kilometres apart in Ayrshire and have frequented the same Australian football scene for decades, he reports not a single mule was shared until Merrick interviewed for the job. "I wasn't doing anybody a favour," McKinna said. "If I picked someone who doesn't do well the buck stops with me, and maybe [owner] Martin Lee would have just moved me on. "It was my decision and I thought Ernie was the right fit at the time for this club." There were signs of things to come from the day Merrick signed last May. He laid out a vision to transform the culture and reinstate the winning mentality that brought the club its first and only title a decade ago, the kind embodied in Saturday's remarkable 10-man defeat of runaway leaders Sydney FC. That meant more attackers, a wider breadth of goalscorers. And, perhaps most pertinently, he had zero interest in a multi-season rebuild. 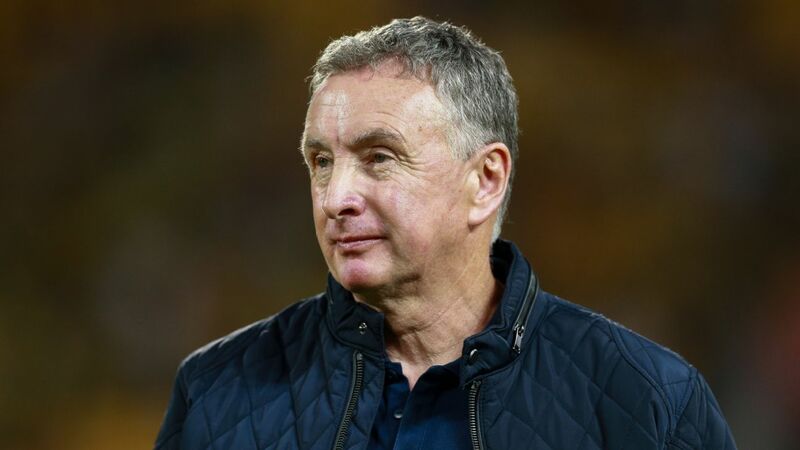 Ernie Merrick has worked wonders in his first season as Newcastle Jets boss. "This is not a five-year plan, it's a one-year plan," Merrick said at the time. "I know what it's like to have success. I want to make the finals in season one." As it turned out, his new squad were aiming higher, and in July they collectively targeted the top three. It helped that the team was already vastly different to that under Jones, courtesy of a Joel Griffiths-led cleanout. 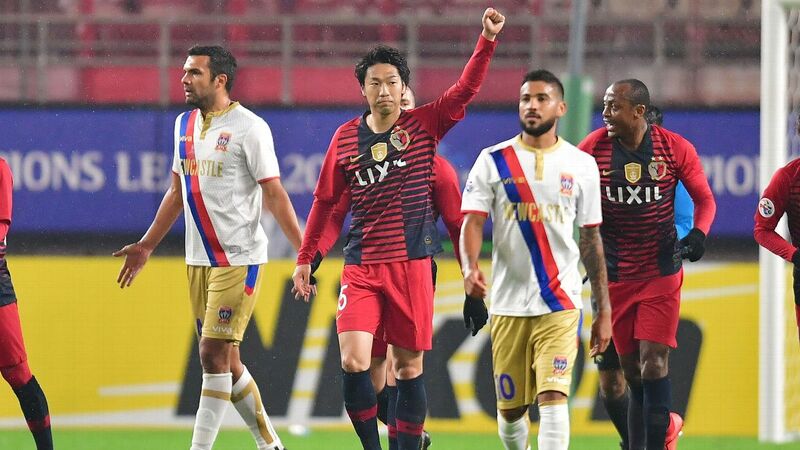 The Jets championship player-turned-football operations manager went hard in the offseason to bring in Daniel Georgievski, Roy O'Donovan, Dimi Petratos, Glen Moss and Nikolai Topor-Stanley. Venezuelan Ronny Vargas followed soon thereafter and Argentine Pato Rodriguez and Riley McGree in January. "We knew something needed to change, and we recruited players who were not so much the most talented, but always up for the fight," Griffiths said. "We definitely have a much better team than what Mark, and even Scott, had. "We brought in winners. And it's a young squad. I look at Sydney FC, and they're older. "That's probably the best thing, we've got players coming into their prime -- they're not even there yet." The result is an adventurous flavour of football yielding 46 goals from 22 games. And it wasn't just the work of new recruits -- the incumbents lifted immeasurably. The already-lively Andrew Nabbout discovered a new level, and with it a propensity for scoring goals so preposterously good he beat Edinson Cavani to ESPN's worldwide goal of the week last month. Then there were others like Jason Hoffman, Ivan Vujica, Joe Champness, Steven Ugarkovic and Ben Kantarovski, the only off-contract player re-signed. "Hoffman and Kantarovski couldn't buy a goal last year," McKinna said. "Look at these two now." Skipper Nigel Boogaard kept flying the flag, a job rendered easier by Merrick's quiet frankness. The regular press conference one-liners are speckled with expectation. Not unkind but direct. If players aren't selected he'll tell them exactly why, work out what makes them tick and build resilience. If they are, it's free rein. "He tells us to express ourselves and play what the game needs," said Petratos. Newcastle held off league-leaders Sydney FC to record and important 2-1 win on Saturday. Griffiths remembers feeling the same way playing under Merrick at Wellington. "He gives players freedom, especially the special players," Griffiths added. "I definitely enjoyed that side of his coaching and you can see some of our players are reaping that reward. "If the A-League had eight or nine Ernie Merricks coaching I'm pretty sure the audiences and TV ratings would be on the up. "For a neutral that goes a long way." 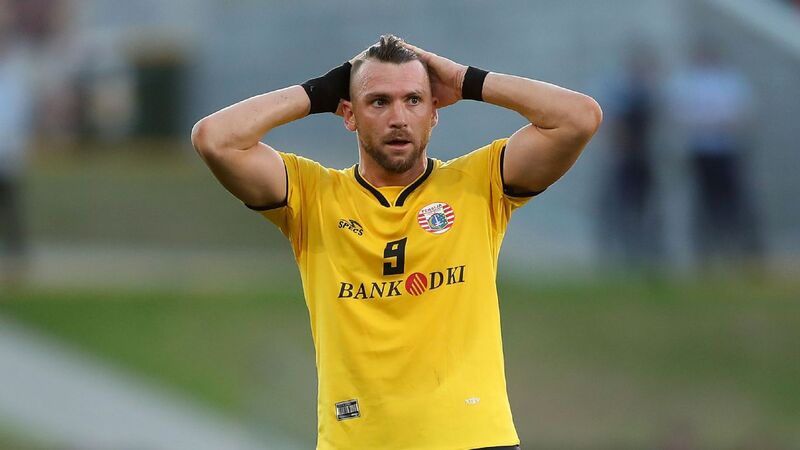 It did on Saturday when the biggest crowd in five years rocked up at McDonald Jones Stadium and diligently booed every time Sky Blues villain Jordy Buijs touched the ball. 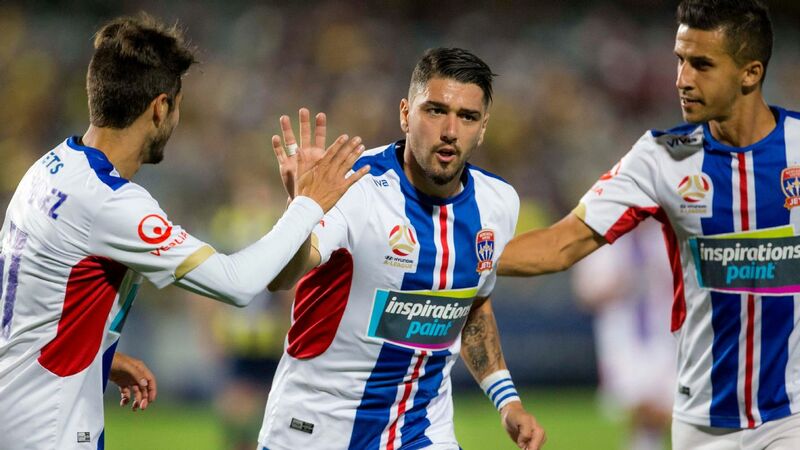 Even after Nabbout had rifled in his long-range winner and Merrick implored his 10 men to protect their 2-1 lead, Petratos was still busy expressing himself, marauding forward to rattle the post for the 18,000 watching. "I know in the past Newcastle's ability to pull in big crowds, and it was great to see it and to deliver, but I didn't think it would happen so quickly," Merrick said afterwards. "Normally in your first year you're trying to get in the finals and do something, but this team's a bit special." Now almost certain to qualify second, the Jets are credible contenders to crash Sydney's Grand Final party, and Merrick is in a two-horse race with Graham Arnold for A-League coach of the year. He will still only speculate about fourth place. Griffiths is willing to go further, tagging this group as the club's closest thing to title-winners since he helped lift the 2007-08 trophy. 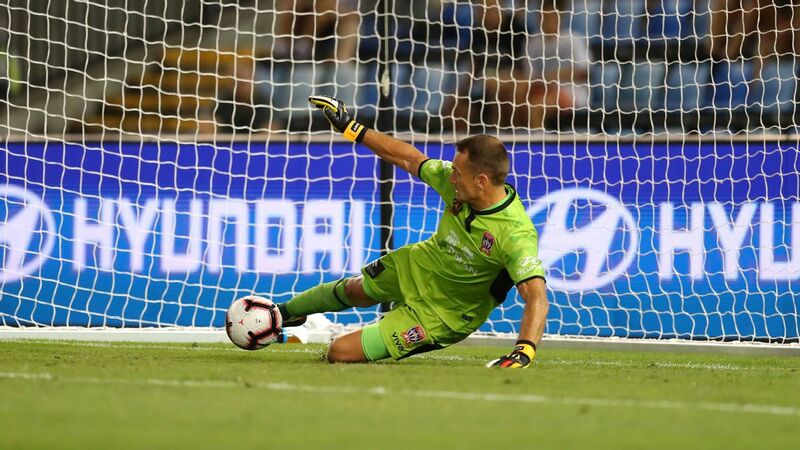 And the 38-year-old might know, having experienced its highest and lowest points, including his 2015 sacking under Nathan Tinkler's tumultuous ownership. McKinna is still picking up the pieces, amid other important off-field steps like moving the club's administration offices next door to the training ground and taking complete control of the academy and W-League. "Mate, it's like a blur," Griffiths said. "It's like, did that s--- really happen? It did, unfortunately. "Those days are definitely behind us. We're trying to create a culture here. "It's not going to happen overnight but if we keep putting in those one percenters it will happen."